After 10 years of production, game engine changes and adaptations, and a laundry-list of development issues, Duke Nukem Forever is still not out. But hey, at least we get Duke Nukem 3D for the iPhone. That news might seem like winning 10 cents in the lottery, but after playing the game, you’ll feel it more akin to winning 10 cents in the lottery and then getting zinc poisoning. This Little Piggie Went to the Morgue: Duke fights mutated pig cops that have uniforms that say ‘LARD’ on the back. Video game humor from 1996 at its finest, ladies and gentlemen. 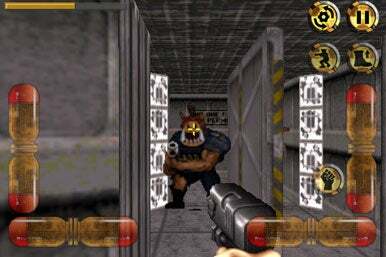 Duke Nukem 3D for the iPhone, developed by Machineworks Northwest, is a straight port of the iconic 1996 first-person shooter. Sadly, the many hours of gameplay are rendered more a chore than a good-natured stroll down memory lane with your crazy gun-loving, chauvinistic friend Duke. Marred by a broken control system and the absence of multiplayer features or secret levels, Duke Nukem 3D for the iPhone gives a “mighty boot” to already beaten-down Duke Nukem fanbase. In that vein, Machineworks Northwest deserves credit for staying true to the source material. The iconic hard rock soundtrack is back, as is Duke’s not-at-all-dated one-liners. He’s got his full arsenal of weapons, including an RPG launcher, shrink-ray, shotgun, and so on. The levels are all ported from the original, making Duke Nukem 3D one of the longest iPhone games to date. Multiplayer, sadly, is not available with the current release. People often forget, but 12 years ago, Duke Nukem 3D was the controversial game on the market. It featured strippers, mutated cops in the form of pigs, thinly-veiled digs at its rival Doom franchise, and a chauvinistic, gun-toting macho man as the protagonist. All of these elements are now on the iPhone (here, the strippers have more clothes on) but the controversy surrounding the franchise is no longer due to the content of the games but the development staff behind those games. The ongoing saga of recently defunct Duke Nukem Forever developer 3D Realms has overshadowed whatever offensive chicanery Duke could ever hope to inflict. Perhaps 3D Realms was afraid of releasing an unfinished product, and after playing Duke Nukem 3D for the iPhone, I can see why. Duke has always been a bit of a stiff, but the iPhone touchscreen controls make him maneuver like Frankenstein dipped in liquid nitrogen. The controls go from frustrating to functional to unbearable over the course of the first few levels. There are two control schemes—“digital” and “analog.” The analog essentially creates two joysticks, one to manipulate movement, the other to manipulate aiming. The default settings are very sensitive, so some fine-tuning of this setup is required before use. Even then it’s a clunky setup as you’ll constantly have to choose between moving, aiming, and using the action buttons to shoot, jump, and duck. As awkward as this setup is, the digital setup is no better. Four movement axes line the bottom parts of the screen, each one responsible for movement or aiming along an X-Y plane. One axis controls Duke’s backward and forward movement, one controls his left and right aiming, etc. This setup is actually preferable during the beginning levels, where you’ll encounter obstacles and enemies predominantly on your visual plane. This setup becomes absolutely useless, however, when you enter the later stages and need to have Duke aim to take out enemies in the sky or jump around the map. Then it’s impossible to aim his gun upwards while moving him in any direction. A note about the graphics: This is a pretty straightforward port of the original 1996 release, complete with the original art (and yes, even the same voice acting). But I did notice some blurriness when it came to the enemy units, and on such a small screen any detail loss gets magnified dramatically. Sadly, there are also some noticeable holes currently in this version of Duke Nukem 3D that fans of the series will notice. There’s no multiplayer and the secret levels are unavailable (currently unlocking a secret level will lead you to the main menu rather than the level). According to Andreas Vasen, President and CEO of Machineworks Northwest, those features will be available in an upcoming add-on. While the controls make the game almost unplayable, Duke Nukem 3D is still a cheap pickup for iPhone users nostalgic for old-school first-person shooter action or chauvinism. Duke Nukem 3D is compatible with any iPhone or second-generation iPod touch running the iPhone 2.2.1 software update.